We left Joshua Tree ripe and ready for showers. Boondocking without shower facilities nearby will really test your relationship. After a couple of days not only do both of you end up hiding your permanent bed-head under baseball caps but you also find that you don’t want to keep adding to the ever growing laundry pile, so you start wearing the same clothes every day (disclaimer: we both always change our underpants, seriously…I swear). This may not seem like a big deal, especially when one of us was used to wearing a uniform every day to work, but when you don’t follow a schedule AND your attire never changes the days begin to blur together. You also stop getting compliments like “Honey, you look so nice today”…except the day you do finally get to shower…and then it doesn’t even matter if you’re still in your pajamas with your hair wrapped in a towel and not wearing makeup. So, we were so excited to get to a campground that not only had full hook-ups but included a laundry facility. 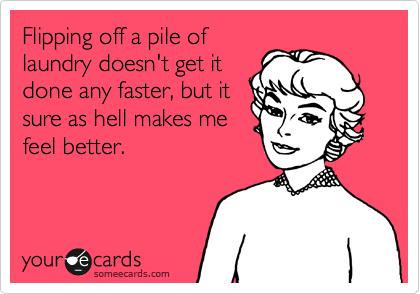 Like most of you, I hate laundry…until I have 40 pounds of funk and campfire scented clothing and nothing left to wear but a bathing suit cover-up and wool ski-sweater. And in case you’re wondering, they do not look cute together. 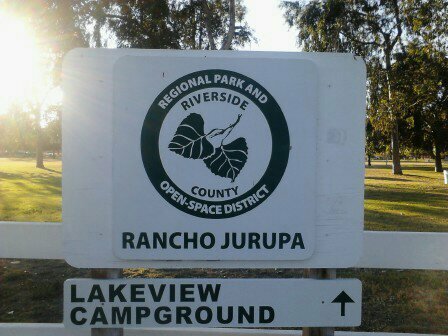 Luckily we scored big time with Rancho Jurupa (a Riverside County Park) thanks to our Passport America handy-dandy directory. This park was like Shangri-La with huge concrete pull-through sites which were spaced out for some privacy and lush green grass every where. The lakes were within sight and the leaves on the trees were turning their fall colors. There were bike and walking trails which lead to even more trails where we came across a few horseback riders. 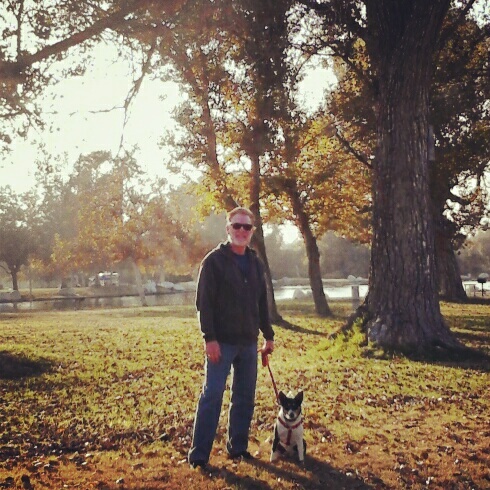 Clark and Cleo at the lake, Rancho Jurupa. And the laundry facility…well, it was exceptional…brand new front load washers and dryers, no waiting and spotless. 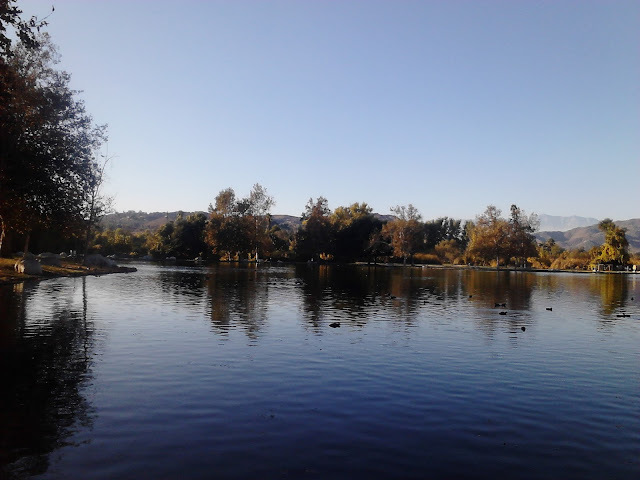 It was hard to believe this was a park run by the County and that we were in Riverside, California. Who knew?! We booked only 2 nights at Rancho Jurupa but would have loved to stay a week or more…however, Thanksgiving Dinner was waiting for us in Los Angeles along with some quality time with Clarks’ brother, sister-in-law and the kids. With such a positive experience at this park and holiday plans looming around the corner it was with great distress (that sounded like “Seriously?? Are you sure?? Maybe you just need to poop?”) that Clark woke up with the dreaded kidney stone pains the morning we were supposed to check out. We rushed to the local Kaiser Emergency Room and got him hooked up to a double dose of pain killers. I made a phone call to the park office to let them know we might not be able to make our check out deadline and they graciously extended it with no extra charge. All I could think was how fortunate we were to have this happen in Riverside and not in Joshua Tree or worse…Death Valley…and that there MUST be a Starbucks somewhere nearby. A few hours later Clark was released and we were somewhat safely (if not still slightly under the influence of Dilaudid) on the road, making good time to L.A. Our stay there was fantastic (and FREE) and our hosts were amazing. We definitely had some of the best food we’ve had on the road, courtesy of my sister-in-law, who also made a special (and successful) effort to cook vegetarian meals for me.